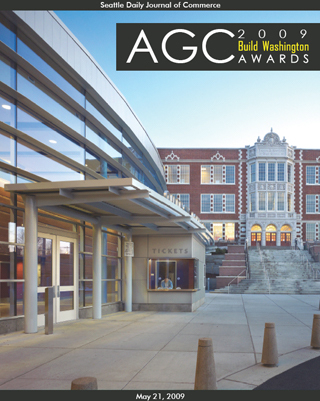 Lease Crutcher Lewis was the construction grand award winner for the renovation of Garfield High School in Seattle. The renovation of the main building included a restoration of its 1920s brick and terra cotta facade. A new building, shown in the foreground, holds a gymnasium and a 595-seat performing-arts theater. The two-year project was completed in time for school in September. AGC of Washington’s Build Washington Awards celebrate the innovation, quality, safety expertise and community spirit of AGC members. The association gave out its annual awards May 20 at Kane Hall on the University of Washington’s Seattle campus in an event emceed by KIRO radio personality Dave Ross. The grand award in construction went to Lease Crutcher Lewis for its renovation of Garfield High School. Aecon Builders and Sicklesteel Cranes took home the grand awards for safety, and special recognition awards were given to superintendent of the year Jeff Robison of John Korsmo Construction and project manager of the year J. Daniel Phelan of Natt McDougall Co.
“The recipients of 2009 Build Washington Awards have increased the efficiency of our transportation system, built state-of-the-art education and health care facilities, improved environmental protection efforts, crafted vital and appealing community spaces, and rebuilt some of the state’s highest profile facilities,” said AGC Executive Vice President David D’Hondt. New in 2009 is the AGC-Moss Adams Service to the Community Award to recognize AGC members who go above and beyond to support the communities in which they live and work. BNBuilders was the first recipient. Construction judges included Julie Blazek of HKP Architects, Clancy Welsh of Garco Construction, Chuck Lynch of the Boeing Support Service Group, Marco Foster of the Washington State Department of Transportation, and Ben Minnick of the Seattle Daily Journal of Commerce. Safety judges were Adam Gerson of OSHA Region 10, Dale Cavanaugh of OSHA Region 10 and Anne Soiza of the Washington Utilities and Transportation Commission. • Ron Morford, president and district manager, General Construction Co.